A roof is expensive. There’s no way around that. It takes years of experience to be able to anticipate the problems that might occur during a new roof installation. Only an experienced roofer understands the ins and outs of the Mesa climate and how it can potentially affect your roof. Only an experienced roofing company is going to be able to guarantee that your job gets done on time and on budget. You want to pay for all of that experience. What you don’t want to pay for is shoddy work, bad customer service, or a bait-and-switch. 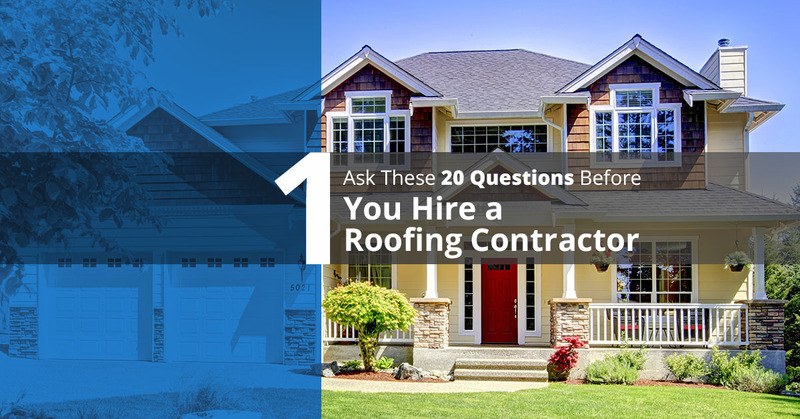 In our next four articles we’re going to go over 20 questions that you should ask a contractor before you hire them. Print these out. Keep them as a checklist. Most of them are applicable to any kind of home improvement or repair contractors, not just roofers. We hope you find them helpful. This list includes some concrete, deal-breaking, yes-or-no questions and some that are more subjective in nature. Don’t skip over either variety. They are both equally important. Here are the first five questions to ask. Are you licensed and insured? Anyone that you hire to work on your house should have the proper licensing and insurance. If you are hiring a contractor for a project and aren’t sure if a license is required, check with the Arizona Registrar of Contractors. You can find reliable consumer information about roofers, general contractors, electricians, and others there. If your contractor is required to have a license, have them show it to you. Take note of the expiration date, and make sure it isn’t set to expire during the course of your project. A lapsed license can have all kinds of repercussions, including voiding your contractor’s insurance. Speaking of insurance, be sure to ask them what insurance coverage they have. Will the same crew work on my project from beginning to end? You want a positive response to this question. At the very least, make sure you get written assurance that the same lead contractor or supervisor will be on site throughout the project. Continuity is important. You want the crew on Wednesday to know exactly what the crew on Tuesday completed, what problems they encountered, and what extra finishing work was or will be required. How do you determine if my roof needs repairing or replacing? The purpose of this question is to make sure that the roofer you are working with has a process that they follow for roof inspections. You don’t want someone winging it. Ask if they have a checklist of things that they look for. If they don’t, they should at least be able to walk you through the process. And, once the inspection is completed, they should be prepared with photos and detailed explanations illustrating why repair or replacement is your best choice. Are you in good standing with the Better Business Bureau? The benefits of BBB accreditation are so great that we’d be a little suspicious of any kind of home improvement contracting company that answered no to this question, or who wasn’t a BBB member. What is your warranty policy? Your roofing material almost certainly is covered by a very good manufacturer’s warranty of 20 years or longer. However, if your contractor does not properly install the material, that warranty can be voided. Make sure your contractor stands by their work, that they’ll come fix any mistakes, and that if they’ve done something to void the warranty they will make any needed repairs at their cost. Those are the first five questions. We’ve got 15 more coming in the next few articles. Bookmark this page. Or at least bookmark the link to the Arizona Registrar of Contractors. That’s going to be a great resource for you if you ever have any questions about a roofing or home repair contractor.If you aren’t sure if your roof needs work, give us a call, we’ll come out for a visit and give you an honest evaluation. When you know that you need your roof repaired or replaced, give us a call. We’ll answer all your questions. We stand behind our work. We’re an A+ accredited BBB business, and we’re proud of the work we do in Mesa and the surrounding areas.